The day began with rain falling, but by late morning the clouds were disbursing and there was a lot of blue sky. After a quick lunch, H and I decided to head for elk country to see some of those grand animals. 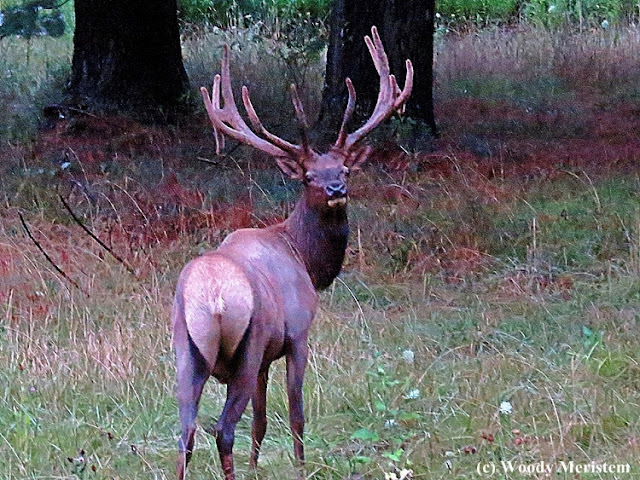 For those of you that operate camera traps and are concerned about “white-flash” cameras, it was quite informative that the elk apparently ignored the bright flashes of lightning but often broke into a brief run at the loud claps of thunder. They only ran for a short way before they resumed feeding; and after a while also seemed to ignore the thunder. We found a few more smaller bands of cows and calves on Winslow Hill feeding in the rain, but no bulls. After several hours of falling heavily, the rain dwindled to a drizzle, fog was developing in the valleys, dusk was upon us and it was time to head for home. Then, in a meadow along Sinnemahoning Creek we found a band of six bull elk. Some of the bulls offered a good chance for a few pictures, but it was so dark that these photos were taken at an ISO of 6400 and 1/20 second and their quality is far from what I would have liked. Come September these bulls will be rivals, competing for cows so they can father a new batch of calves – I’ll be back. Still can't get over you having Elk in Pennsylvania. 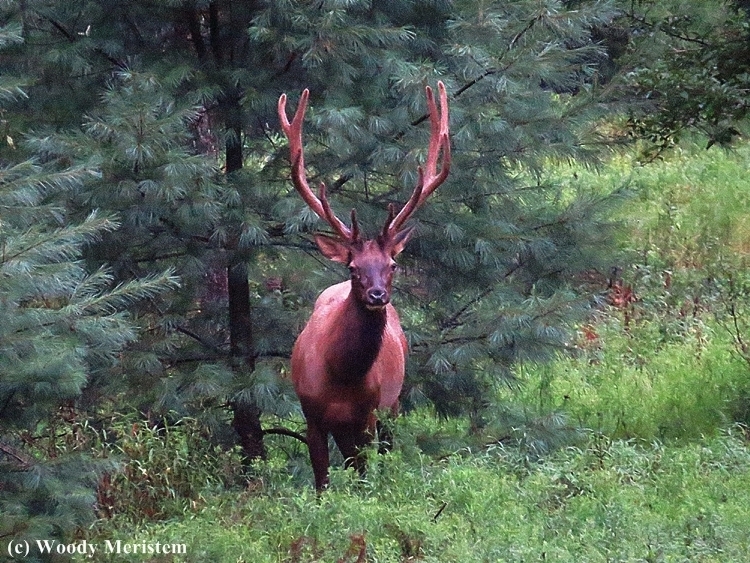 Wow - so many fabulous elk! So nice, I love all the pictures. Thank you so much. Hello, wow that is a lot of elk! Wonderful collection of photos. Thank you for linking up and sharing your post. Happy Saturday, enjoy your weekend! Before European settlement there were elk throughout Pennsylvania but they were gone by the late 1870s. Elk were reintroduced from 1916 until 1926, and managed to survive only in the same area where the last native elk were found. the reintroduction was a success -- sort of -- with a small population of elk hanging on; at times the population was less than 50 animals. Better management has allowed the population to increase and now numbers 800-1,000 animals. truly beautiful. love the terrain, too. Very nice shots! Hoping to visit there at the end of September. Your photographs are stunning - we aren't lucky enough to have elk in our area, but it's lovely to see them through your eyes! Thank you for sharing.